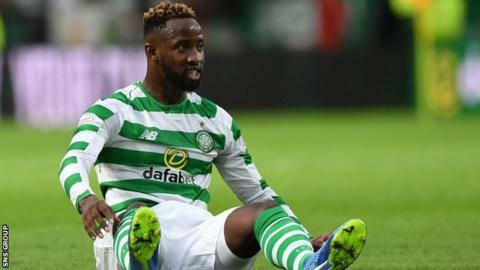 Celtic striker Moussa Dembele will miss the Champions League qualifier against Rosenborg with a hamstring problem. The 22-year-old picked up the injury in last week's second leg of the opening 6-0 aggregate victory over Alashkert. The Frenchman is expected to be out for up to two weeks more. "It was just a minor strain," said manager Brendan Rodgers. "Sometimes the hamstring can be six to eight weeks but this one, from the time it happened, we were told two to three weeks maximum." Dembele scored twice in Celtic's 3-0 victory in Glasgow before limping off in the second half. Celtic host Norwegian side Rosenborg on Wednesday (19:45 BST kick-off) before travelling to Trondheim for the return on 1 August. "He'll certainly miss both legs of this round," added Rodgers. "It's unfortunate because he's looked very good over pre-season, but he'll be back fit and strong in the next few weeks." Fellow striker Leigh Griffiths is a doubt for the first leg at Celtic Park, as is winger Jonny Hayes, both of whom have thigh injuries. Should Celtic progress, they will face AEK Athens of Greece in the third qualifying round, while the loser will drop into the Europa League qualifiers and take on Cork City.